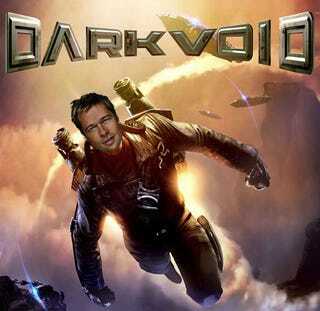 Brad Pitt's production company Plan B Entertainment and Capcom have come to an agreement over the movie rights for Dark Void, now being developed as a sci-fi thriller and potential Pitt starring vehicle. Capcom's third-person shooter isn't out until January, but Pitt's production company seems to think it has potential at the box office. Plan B Entertainment now holds the rights to a theatrical version of the game under its Creative Partnership with Reliance BIG Entertainment. Said theatrical version would likely follow the story of game protagonist Will, who crash lands in the Bermuda Triangle and wakes up in the mysterious Void, where an ancient alien race plots to take over civilization. According to the Capcom press release, the movie version is being developed with Brad Pitt himself in mind for the starring role. "As a game, Dark Void was developed with a wide-screen mentality - a world full of adventure presented in cinematic scope and scale," said Germaine Gioia, senior vice president, licensing, Capcom Entertainment. "Plan B recognized the potential of our newest property and are as excited about bringing Dark Void to life in cinemas as Capcom is to bring the interactive experience to home theaters." Sounds great! I've been waiting a long time for a sequel to The Rocketeer.